As the refrigerant warms, it turns into a vapor and travels to the indoor coil of your heat pump. A blower fan then pushes this heat through your ductwork and your vents. Thanks to advanced technology, the heat pumps that Poore’s installs today can keep your home toasty warm even when outdoor temperatures drop below the freezing point. Have you heard about ductless heat pump systems? We have been installing these systems for years, because they solve a big problem: They deliver cooled air to rooms that can’t be cooled effectively using central air conditioning. Basically, a ductless heat pump system (also known as a mini-split system) lets you put cooling—or heating—precisely where you need it. Most people install mini-split systems for air conditioning because they have no ducts. But they get an added bonus because the system can also provide supplemental heat to reduce oil or propane consumption during the milder parts of the heating season. Ductless systems are also a popular choice to replace window units, which allow you to open windows up for fresh air when you don’t need cooling. The wall units are unobtrusive and fit with any decor. They are quiet and include a remote control. Installing a ductless system is not as involved as installing new central air conditioning—in fact it’s relatively easy. For each room that needs more heating or cooling, we’ll install a compact wall unit. We can install multiple indoor units, which all connect to one outdoor compressor. Only minimal drilling is necessary to complete the installation of your ductless system. 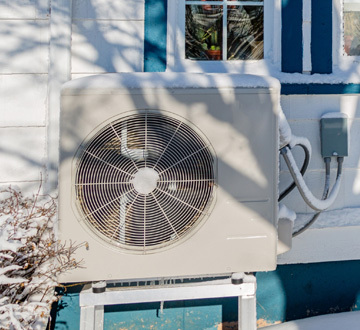 Besides installing traditional heat pumps and ductless mini-split heat pump systems, the Poore’s team can help you with heat pump maintenance service and heat pump repairs to keep your system operating at peak efficiency all year round. Find a new heat pump system today! Contact us or call your local Poore’s office.